Tommy Ward (left) and Alvaro Rodriguez after yesterday's weigh-in. 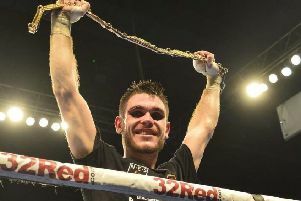 Tommy Ward has revealed that it was far from easy walking away from his “beautiful” British title. But he knows a win tonight could put just one fight away from a shot at world honours. And that’s enough justification for the West Rainton super-bantamweight to vacate and take a different route to success. Unbeaten Ward has endured a frustrating 2018 to date, with fights rescheduled, cancelled and at times hanging in the balance. He’s determined to put that all behind him this evening when he takes on Spaniard Alvaro Rodriguez for the IBF European title at Rainton Meadows Arena. “It has been frustrating for me,” he said reflecting back on his year so far, which has seen him vacate his British title. “I’ve kept my focus, kept myself right and always kept in the gym. “It is not easy being in the gym and being fully committed without a fight coming at the end of a camp, but things are starting to move now. 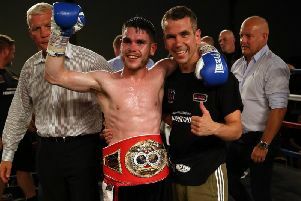 The 24-year-old, trained in Hartlepool by coach Neil Fannan, made just a solitary defence of the title he won off James ‘Jazza’ Dickens, who was due to fight brother Martin Ward this evening for the title, but for a hand injury suffered in the build-up by Ward senior. It’s a situation that saddens him in some ways – Ward admits he’s have loved to have two more defences and win it outright. But he knows it’s a sacrifice he’s got to make to get to where he wants to be – among the world’s elite. “If I take care of Rodriguez, hopefully things will take off,” said Ward. “There have been a lot of things going on behind closed doors which I will not speak about. “We all sat down and worked out what I route I wanted to go down. “It wasn’t easy. I would have been happy to fight for the British title and win it outright. It’s a beautiful belt. Ward added: “Everything has gone well for me in camp – I cannot wait to put on a show. “This is definitely a step in the right direction for me. There is talk that I am only two fights from a world title shot.